Sub: Policy on Drunkenness on Duty. Ref: PNM item no. 29/2018. Vide PNM item no. 29/2018, NFIR raised certain issues regarding policy on drunkenness on duty. During the discussions it was decided that Board shall issue clarification to the Zonal Railways on the subject. As per the Drunkenness Policy issued vide Board letter No.2001/Safety-1/23/4 dated 27/11/2001 and Health Directorate letter No.99/H/7/C dated 15.12.2003, if running staff is found positive in the breath analyzer test. he should be sent for medical examination as per the Medical Manual paras 565 to 567. Zonal Railways shall upgrade all the breathanalyzers as per the latest specifications issued. by the RDSO in September, 2015. In all crew booking lobbies, breathanalyser should be integrated with the Crew Management System. If an employee fails in the breath analyzer test, second test should not be conducted and he shall be subjected to medical examination. Punishment norms prescribed under the present policy does not distinguish between the alcohol levels during Signing-on and Signing-off. So, the norms of punishment should be considered same if the employee found alcoholic at the time of signing-on or signing-off. However, if the alcohol level of 1 to 40 mg/l00ml of blood is found during signing-off, concerned staff shall be issued with minor penalty charge sheet. Sub: Revised Policy on ‘Drunkenness on duty’. Board has approved the revised policy on drunkenness in order to make it more effective for controlling drunkenness amongst staff, particularly safety categories. Revised Policy is sent herewith as annexure. Railways are directed to get these policy booklets printed and implement the revised policy on their system. Necessary changes in concerned manuals shall be made by Ministry of Railways and will be advised in due course. Safety(A&R) Branch for processing the modification in the concerned G.R. DG/RDSO for early standardization of State- of-Art Breathalyzers. DG/Health for processing necessary changes in Medical manual. Ensuring that staffs who are having a drinking problem are identified. Protect the health and welfare of staff by offering counselling and rehabilitation to those with alcohol related problems. Prevent risks to staff, passengers and the general public from abuses of alcohol by staff in Safety critical posts. Prevent the damaging effects of alcohol on optimum operational efficiency. Take up with staff who are incorrigible and are a danger both to themselves as also to the system. A booklet should be got printed by all Zonal Railways briefly explaining the revised alcohol policy of Indian Railways, its aims and objectives, along with its benefits both for the staff as also for the organisation as a whole. It should be made applicable to all categories of Staff. However, for the present, for overcoming logistic problems, it is proposed to introduce it only for those categories of staff connected with train running. (c) Pointsmen / Leverman/ Cabinmen/ Switchmen. However in first phase it is to be introduced for the running staff as they are directly involved in train running and their mistake may cause a serious accident which is detrimental to safe running of passengers. The running staff viz driver, Asstt Driver shall undergo breathanalyser test both at the time of signing-on and Signing off as per Railway Board instructions. The Station /yard staff and other categories of staff will be subjected to Sample test/ Surprise test by supervisors and officers carrying portable breathanalysers. Officers should keep a list of all Senior Supervisors working under them who are habitual of drinking. Similarly, Senior Supervisors should keep a list of all staff working under them that is habitual of drinking. All such staff who is short-listed would now form the target population. They must be divided into two categories as Chronic or Habitual depending on the severity of their drinking habits. The idea is that each level ‘N’ must keep a watch on level ‘N–1’ immediately below. For example, LI should keep a watch on all short listed drivers attached with him; Crew Controller should keep a watch on all such Asstt. Drivers, and similarly Station Master should keep a watch on the staff posted at his station. (a) Between 01- 20 mg/100 ml, the person concerned will not be allowed to perform duty. (b) Between 21 - 40 mg/100 ml of blood is dangerous. (c) Between 41 - 70 mg/100 ml of blood is very dangerous. (d) Beyond 70 mg/100 ml of blood requires immediate action. The following reformative action is to be taken for the staff short-listed as either chronic or habitual. Counselling of staff during initial/promotional training courses and periodical medical examination. Employees should be told about hazards of drinking as also about the short and long-term effects of drinking. (a) Not drinking alcohol eight hours before going on duty. (b) Should not have smell of alcohol on their breath while on duty. (c) Should not drink alcohol while on duty. The railways may either decide to organise de-addiction camps within their own resources on the same pattern as Southern Railway. Alternatively, NGOs should be identified at Zonal Head quarters and preferably at each divisional Head quarters also for organising rehabilitation programmes for deaddiction. Organising of these camps at regular intervals must be a continuous process and should not be given up after a one-time exercise. The modalities for organising such de-addiction camps may be worked out with each NGO on a long-term basis. It can be decided as a policy that in case some expenditure is incurred by the railway by way of payment to NGOs, then 50% of the same may borne by the railway and 50% by the staff concerned. The staff that has been categorised as habitual should be sent first, on priority, for undergoing rehabilitation programme for de-addiction at the nominated centre in preference to staff who have been categorised as cronic. Staff who go for the de-addiction camp and successfully complete it will be kept under watch for a further period of 6 months and thereafter taken off the list. Staff who undergo the rehabilitation programme but are unsuccessful in their first attempt will be given a second chance for undergoing the de-addiction camp. Staff who is unsuccessful a second time will be medically decategorised and taken off Safety critical posts. (b) Special check to be kept on their working with particular reference to frequent and surprise breathalyser tests and blood/urine samples. (c) Any lapses on their part will be dealt with as laid down under item no. 5. While recruiting staff for safety critical posts of Asstt. Driver or Lever man or ASM, each candidate must be screened for alcohol content in their blood. Alcohol level of any amount will render the candidate unsuitable for recruitment. Each staff should be held responsible for ensuring that they do not hand over/take charge from another staff who is under the influence of Alcohol. Failure to do so will make them liable for disciplinary action. Each staff should be held responsible for ensuring that they report all cases of any of their co-workers who is under the influence of Alcohol on duty. Failure to do so will make them liable for disciplinary action. All Driver’s and Guard’s Lobbies must be provided with heavy-duty breathalysers, which are capable of indicating the blood alcohol level from breathalyser test alone. A stand by breathalyser may also be made available. All Running/Operating Officers/Inspectors must be provided with portable breathalysers for conducting surprise checks especially with regard to those staff who have been categorised as either chronic or habitual. No Running staff will be allowed to sign on for duty without undergoing the breathalyser test. The readings of the breathalyser test must be entered in the signing on register. In case the result of the breathalyser test is positive then a printout of the readings must be obtained for further action. In case the staff concerned refuses to co-operate in undergoing the breathalyser test, he should be taken up under D&AR. Immediate supervisors of staff should be used as auditing agency for purposes of conducting surprise checks etc. Post Accident medical examination of all the involved staff should invariably be resorted to immediately. This should be irrespective of whether the staff concerned is prima facie responsible for the accident or not. Post Accident medical examination will give employees involved the opportunity of proving that alcohol played no part in causing the accident. The employee should be removed from safety critical post while waiting for the results of the Post Accident medical examination. In case results of the alcohol test are positive then the staff concerned should be taken up under D&AR. Will not be considered for promotion. To be taken up under D&AR proceedings. If a Supervisor/Officer has a reasonable cause to suspect the fitness on duty. Relieve from duty, until tested. Remove from safety critical duties while waiting for results. If the result of the random medical check turns out to be positive, then the staff concerned should be taken up under D&AR. Staff who is found with alcohol level of between 01 – 20 mg/100 ml of blood will not be permitted to perform duty. Staff who is found with alcohol level of between 21 – 40 mg/100 ml of blood will be issued a minor penalty in each case. issued a major penalty in each case. Staff who is found with alcohol level of beyond 70-mg/100 ml of blood will be placed under suspension and disciplinary proceedings initiated against him for reversion from the safety critical post. For repeated detection of 3 times, irrespective of the level of alcohol detected, disciplinary proceedings will be initiated against the staff concerned for reversion from the safety critical post. State of Art Breathalyser equipment capable of giving exact level of Alcohol content in the blood including print outs need to be introduced. These breathalysers should necessarily have the memory function so as in case of suspect a print out can be taken at a convenient location. Traffic Directorate of RDSO will standardise specifications of Fuel cell sensor based breathalysers. (i) Amendment in the Indian Railway Act. (ii) Amendment in the Medical Manual. (iii) Inclusion of a Chapter in the General and Subsidiary Rules. (iv) The above amendments can only be carried out after holding discussions with organised labour unions. Article 172: Penalty for Intoxication: If any Railway servant is in a state of intoxication while on duty, he shall be punishable with fine which may extend to five hundred rupees and when the performance of duty in such state is likely to endanger the safety of any person travelling on or being upon a railway, such railway servant shall be punishable with imprisonment for a term which may be extended to one year, or with fine or with both. GR 2.09 Taking Alcoholic drink, sedative, narcotic, stimulant drug or preparation. (i) While on duty no railway servant shall, whether he is directly connected with the working of trains or not, be in a state of intoxication or in a state in which by reason of his having taken or used alcoholic drink, sedative, narcotic or stimulant drug or preparation his capacity to perform his duties is impaired. (ii) No railway servant directly connected with the working of trains, shall take or use any alcoholic drink, sedative, narcotic or stimulant drug or preparation within eight hours before the commencement of his duty or take or use any such drink, drug or preparation when on duty. (i) Railway servant found in a state of intoxication on Railway premises whether on or off duty, will be liable to summary dismissal. (ii) When any railway servant is found intoxicated on the railway premises or suspected to be in a state of intoxication, the evidence of two independent witnesses and if possible, a medical report regarding his condition should be obtained. Arrangements for his relief should be immediately made and matter reported to the proper authority. (i) As per Indian Railway Medical Manual (Article 564), a person is drunk when he is so much under the influence of an intoxicating drink or drug as to lose control of his faculties to such an extent as to render him unable to execute safety the occupation at which he is engaged at the material time (Ministry of Railways letter No.69/H/3/26, dated 03-01-70). (a) Whether the person concerned has recently consumed alcohol. (b) Whether the person concerned is so much under the influence of alcohol as to have lost control of his faculties to such an extent as to render him unable to execute safely the occupation on which he was engaged at the material time. (c) Whether his state is due, wholly or partially, to a pathological condition which causes symptoms similar to those of an alcoholic intoxication, irrespective of the amount of alcohol consumed. (iii) He should not certify the case as drunk just because patient smells of alcohol. The quantity taken also is no guide, but the fact of impairment of his capacity to perform his duties has to be taken into account. (iv) The program for recording particulars of suspected cases of drunkenness is annexed herewith. (1) Every case of drunkenness is a potential medico-legal case and the Railway doctor called upon to certify such a case should make a careful examination and should note down every important particular. (2) Railway doctors may also have to issue drunkenness certificates to persons produced by police at places where there are no civil hospitals or dispensaries and only a Railway hospital or health unit exists. (b) The person is actually drunk i.e. under the influence of alcohol. (1) The Performa for recording particulars of a suspected case of drunkenness is given in Annexure-XIX to this chapter. This form should always be kept handy as the Railway doctor may be called upon to certify drunkenness at any moment and sometimes away from his headquarters. (i) Whether the person concerned has recently consumed alcohol. (ii) Whether the person concerned is so much under the influence of alcohol as to have lost control of his faculties to such an extent as to render him unable to execute safely the occupation on which he was engaged at the material time. (iii) Whether his state is due, wholly or partially, to a pathological condition, which causes symptoms similar to those of alcoholic intoxication, irrespective of the amount of alcohol consumed. (1) He should not certify the case a drunk just because the patient smells of alcohol. The quantity taken is also no guide, but the fact of impairment of his capacity to perform his duties has to be taken into account. 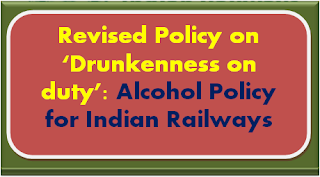 (1) When a Railway doctor is called upon to certify a case of drunkenness in a Railway employee, he should after careful examination immediately report by a telegram or urgent letter his opinion to the immediate superior or Divisional Officer of the employee concerned intimating whether the employees should be put off duty or not. (2) When a Railway doctor is asked to certify the crew of a running locomotive and if on examination he finds a member of the same under the influence of alcohol, he should immediately issue a memo to the authority concerned, putting the person off duty. (3) As far as possible, the Senior Assistant Divisional Medical Officer themselves should undertake to examine such cases of drunkenness rather than depot their juniors, and in case of doubt, should refer the case to the Divisional Medical Officer or Assistant Divisional Medical Officer in charge of his section.